The cloud assistant client allows you manage your ECS instances in a safe and secure manner. Specifically, the client allows you to automatically execute one or more daily maintenance commands, run automated O&M scripts, poll the processes, install or uninstall software, update applications, install patches, and more. The cloud assistant client is available free of charge. However, the running of your ECS instances will incur fees. For more information, see Pricing overview. By installing the cloud assistant client on ECS instances, you can run Bat or PowerShell scripts (for Windows instances) or Shell scripts (for Linux instances) on one or more running (Running) ECS instances through the ECS console or API. The selected instances do not impact each other. You can also set Timed Invocation to keep an ECS instance in a specific status, obtain its monitoring and log information, or run a daemon process. The cloud assistant client does not initiate any operations. That is, only a user can execute specific operations as required. The following table describes relevant concepts of the cloud assistant client. Cloud assistant Cloud assistant A convenient feature provided by Alibaba Cloud ECS for automated batch invocation of daily maintenance tasks. Cloud assistant client Client The client program that is installed in ECS instances. The task process is included in AliyunService. All operations on ECS instances are performed by using the client. Command Command Specific commands to be invoked on ECS instances, such as a Shell script. One-time invocation Invocation An occasion when a command is carried out (that is, invoked) on one or more instances only once (Invocation). Periodical invocation Timed invocation When you invoke a command on one or more instances, you can specify the invocation sequence (that is, the time period) to run the command periodically. Invocation status InvokeStatus The relationship among command invocation status. For more information, see Lifecycle of command execution. You must install and manage the cloud assistant client as the administrator. Specifically, the Linux instance administrator is root and the Windows instance administrator is administrator. In each Alibaba Cloud region, you can have up to 100 cloud assistant commands. In each Alibaba Cloud region, you can run up to 500 cloud assistant client commands per day. ECS instances in the Cloud Assistant service is available in all Alibaba Cloud regions. For Timed Invocation commands, the Timed interval cannot be less than 10 seconds. The size of Base64-encoded Bat or PowerShell scripts, or Shell scripts, cannot be greater than 16 KB. The target ECS instance must be in a Running (Running) status. Currently, the cloud assistant client is supported by the following operating systems only: Windows Server 2008/2012/2016, Ubuntu 12/14/16, CentOS 5/6/7, Debian 7/8/9, RedHat 5/6/7, SUSE Linux Enterprise Server 11/12, OpenSUSE, Aliyun Linux, and CoreOS. You must install the cloud assistant client on your ECS instance before using the client. You can use it through APIs. For more information, see Automatically manage instances. A command may have the following status when running on an instance. Being executed Running The command is being executed. Stopped Stopped A command was stopped during its execution. Execution finished Finished The command invocation is finished. However, this does not indicate the invocation is successful. You can check whether the invocation is successful by checking the actual output (Output) of the command process. Execution failed Failed The command invocation did not finish when the timeout time (Timeout) was reached. 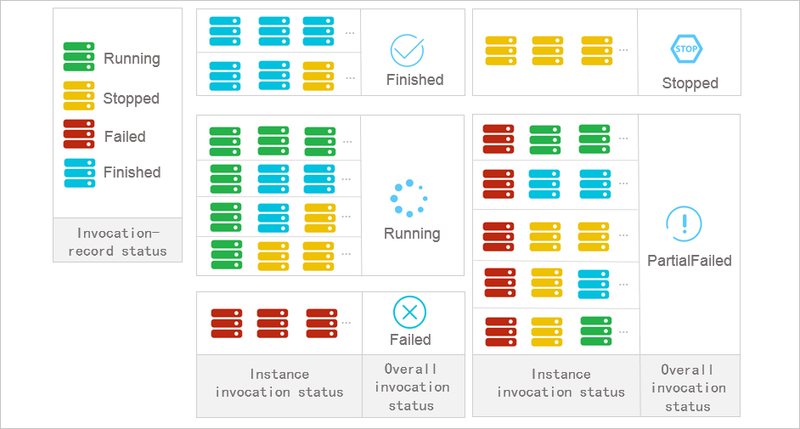 To facilitate the management of bulk or periodical execution, you can manage the lifecycle of command execution from the perspectives of overall invocation status, instance invocation status, and invocation record status. The relationships among various levels are shown in the following figure. while the status of other instances are Stopped (Stopped). Instance invocation status One-time batched execution is a one-off operation, so the instance invocation status is the same as the invocation record status. Invocation record status See the table The status of commands executed on an instance. Take three ECS instances for example. The following figure shows the relationships between the overall invocation status and the instance invocation status during a one-time execution on multiple instances. Overall invocation status The overall invocation status remains Running (Running) unless you stop the invocation on all instances. Instance invocation status The instance invocation status remains Running (Running) unless you stop the invocation. Query the invocation results and status. InvokeCommand: executes created commands on the target ECS instance. DescribeInvocations: queries the execution status of commands. DescribeInvocationResults: queries the execution results of commands, that is, the actual output information in the specified ECS instance (Output). StopInvocation: stops running command processes. ModifyCommand: modifies the contents of created commands.